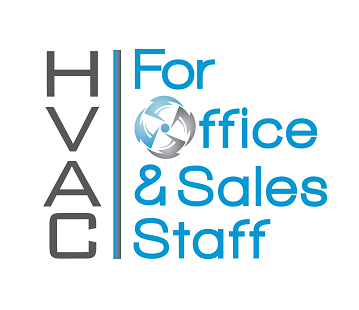 HVAC for Office & Sales Staff is a self-paced, online program that explains the basics of HVAC equipment, how important the HVAC contracting industry is, and how vital the role of each employee is in running a successful contracting company. HVAC is a necessary industry! We make it possible to keep people comfortable no matter the environment. HVAC is about selling the number one thing people want... Human Comfort. This unique resource is ideal for HVAC business employees such as dispatchers, salespeople, customer service, and any other office staff who would like to know more about how central heating and cooling systems work. The cost for the online program is $60.00. By the end of this course, viewers will understand the basics of HVAC systems and how central heating and cooling systems work. To take the full course is just a little over 2 hours. You can access the course anytime of day, it's available 24/7. Just log in and pick up where you left off. 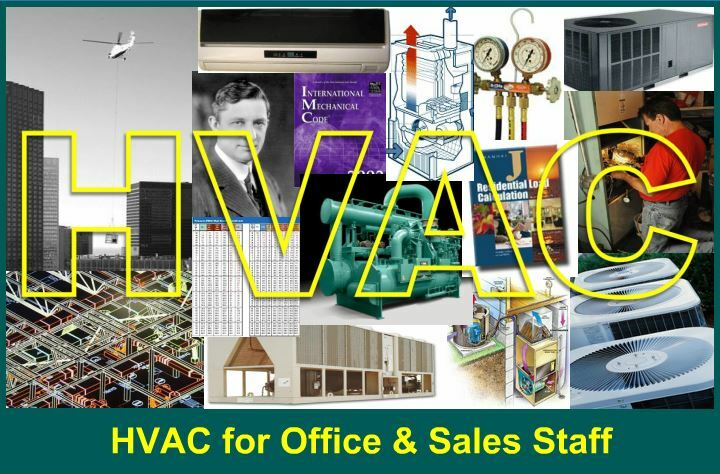 HVAC is defined along with a brief history and the industry’s relevance in modern society is explained. Human comfort is discussed and explained as the primary product that our industry sells. The importance of customer interaction is discussed at all levels in any size company. Business cycles with respect to weather and the economy are revealed. The flow of paperwork within a company and the product chain of distribution are detailed. Simple definitions are provided for Btu, CFM and a ton of cooling. A distinction is made between furnaces and boilers with an explanation of how both work. AFUE and SEER ratings are defined as well as Energy Star requirements. An air conditioning system is built from the ground up and all major parts are described and explained. A brief discussion is offered on the phase-out of R-22 and the emergence of R-410a. Heat pump operation is explained as well as HSPF and COP ratings. Duct system types are briefly reviewed. The standards and codes that regulate the HVAC industry are discussed. The cost of doing business is explained in detail. The need for training is explained and the trade associations are enumerated. The need to distinguish your company from the competition is discussed. Accessories such as humidifiers, electronic air cleaners, media air cleaners, UV lights, programmable thermostats and HRV/ERVs are all explained and their application discussed. Once you enroll and pay, you will receive an email to sign in/register. If it's your first time using our new system, you will need to enter your access code and user information. If returning, just use the link above and use the “Sign In” tab and enter your email address and password. Once you are in, you will see a 3 part video instruction. You can access the course anytime of day, it's available 24/7. Just log in and pick up where you left off. Once you have completed each section, there is a 10 question quiz, you need to earn 70% to earn a course certificate.